The Neapolitan coffee maker produces coffee with a light body and a full taste! It is made two parts: The bottom part is for the water and the top part is the spout. The filter and coffee grind go in the middle. You flip it over (using the second handle) when the water has reached the right temperature. Once the water has passed through the grind, the coffee is ready in the bottom part. At MaxiCoffee, our experts have selected the best brands for Neapolitan coffee makers at the best prices : ILSA, Alessi, etc. 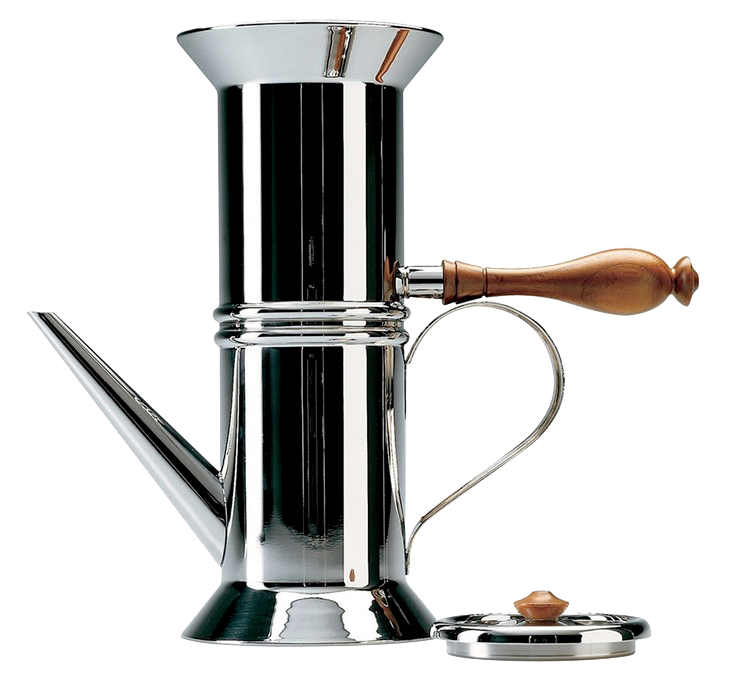 Stylish "DIAMANTE" Neapolitan coffee maker - 1/2 cups (150ml) - made from aluminium, by Italian brand ILSA. Attractive "DIAMANTE" Neapolitan coffee maker - (3 cups 250ml) - made from aluminium by the Italian brand ILSA. Attractive "DIAMANTE" neapolitan coffee maker - 6 cups (450 ml). This Neapolitan flip coffee maker will delight fans of real Neapolitan coffee! Attractive 9-cup (600 ml) Neapolitan coffee maker - in aluminium. This Neapolitan flip coffee maker will delight fans of real Neapolitan coffee! 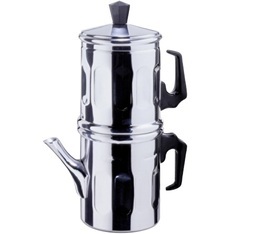 Attractive 12-cup Neapolitan coffee maker (1 litre) - in aluminium. This Neapolitan flip coffee maker will delight fans of real Neapolitan coffee! Attractive stylish Neapolitan flip coffee maker - (1/2 cups 150ml) - made from aluminium by the Italian brand ILSA. Attractive stylish Neapolitan flip coffee maker - (3 cups 250ml) - made from aluminium by the Italian brand ILSA. Attractive 6-cup Neapolitan coffee maker (45 ml) - in aluminium This Neapolitan flip coffee maker will delight fans of real Neapolitan coffee! Attractive 9-cup (600 ml) Neapolitan coffee maker - in aluminium This Neapolitan flip coffee maker will delight fans of real Neapolitan coffee! Attractive 12-cup (1 litre) Neapolitan coffee maker - in aluminium This Neapolitan flip coffee maker will delight fans of real Neapolitan coffee! Attractive neapolitan coffee maker in 18/10 stainless steel - 150 ml. This Neapolitan flip coffee maker will delight fans of real Neapolitan coffee! Attractive Neapolitan coffee maker made from 18/10 stainless steel- (3 cup - 250ml) - by the Italian brand ILSA. Attractive Neapolitan coffee maker made from 18/10 stainless steel- (6 cup - 400ml) - by the Italian brand ILSA. Attractive neapolitan coffee maker in 18/10 stainless steel - 9 cups (550 ml). This Neapolitan flip coffee maker will delight fans of real Neapolitan coffee!